On my recent holiday to North America, I watched the documentary 20 Feet From Stardom on the plane - which is a film about backing singers like Merry Clayton, Darlene Love and Lisa Fischer. A similar film could probably be made about band members who go on to make it in their own right (or not make it, as the case may be). I'm thinking Wendy & Lisa, Sheila E, André Cymone... and that's just people who played with Prince. This week in 1988, Australia welcomed the guitarist who played with one of the country's most successful singers into the singles chart. The man in question would, in turn, become... one of the country's most successful singers. The man who actually was the most successful singer in the land this week in 1988 was Bobby McFerrin, who ascended to the number 1 spot with the abysmal "Don't Worry Be Happy" - and there it would stay for seven long weeks. The follow-up to "Just Like Paradise", "Stand Up" had surprisingly missed the top 100, but this understated - for David Lee Roth - single from Skyscraper had a brief run on the chart. His name might not be immediately familiar to Australian chart followers, since he didn't score a hit here under his own steam, but any '80s fan worth their salt would know songs like "Love Plus One" and "Fantastic Day", which Nick performed as singer for New Romantic band Haircut 100. The group was an instant success back in 1982, but the fame took its toll on Nick, who made a controversy-plagued exit from the group after just one album. A couple of solo albums followed, with mediocre UK chart action for singles like "Take That Situation" and (my favourite) "Warning Sign". "You're My World", which I hadn't heard until now, was the first single from Nick's third album, I Love You Avenue, and it's actually pretty good. However, it could only manage a chart peak of number 67 in the UK and missed the Australian top 100 completely despite being fairly similar in style to songs from late '80s hit-makers Wet Wet Wet and Johnny Hates Jazz. Machinations (and they're still around, since they performed not too long ago) really need to sort out their YouTube presence since it's making my job of extolling their virtues very hard. Granted, "Do It To Me", the third single from the Uptown album, wasn't as good as some of their bigger hits - but it was another slice of slick Australian funk/pop that deserved to do better. EDIT: Hurray, the music video has finally been uploaded... in 2017. Although I hated Australian chart-toppers "Addicted To Love" and "Simply Irresistible", I wasn't opposed to Robert Palmer as an artist per se. In fact, songs like "Looking For Clues", "Johnny And Mary" and "I Didn't Mean To Turn You On" from earlier in his career were all quite good and can be found in my iTunes library - as can this track. Actually, both Robert's number 1s are also in my iTunes library, but they appear on so many '80s compilations, that was kind of unavoidable. Anyway, sweet, soulful, string-laden love song "She Makes My Day" was the musical antithesis of those aggressive, overtly sexual rockers - and all the better for it. Here he is... well, I should say: here they are, since Johnny Diesel (aka Mark Lizotte) did have a band when he first hit the charts. The pun-tastically named Injectors even included a member with the soundalike name of John Dalzell, but it was all about the pretty boy frontman who'd played guitar on Jimmy Barnes' Freight Train Heart album and toured in his band. "Johnny" and his own band also opened for Barnesy, which helped them amass somewhat of a following, before launching their recording career with this top 10 single. Not surprisingly, I wasn't a massive fan of JD & The Is, but I found their brand of pub rock slightly more palatable than Jimmy's - and Diesel's voice much less objectionable. Just a few years earlier, a new Duran Duran album would have been greeted with mass hysteria and a top 10 single or two. Not so in 1988 with the release of the band's fifth album, Big Thing. 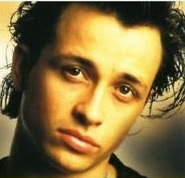 Lead single "I Don't Want Your Love" didn't even cracking the top 20 locally and the two follow-ups, "All She Wants Is" and "Do You Believe In Shame? ", didn't make the top 50 at all. As a Duran Duran fan from the outset, I thought "I Don't Want Your Love" was a good lead single - but music was moving on, and the quintessentially '80s band would have a tough time transitioning into the '90s for the next five years. It's pretty unusual for a second single to follow so quickly behind a debut release, so it was a little surprising to see the second track lifted from Melissa's self-titled album appear on the ARIA top 50 just three weeks after "Similar Features" entered the singles chart. It wasn't completely unheard of, however. As we saw with the chart performances of the first two hits by Mel & Kim and Bon Jovi in Australia, a bigger second single can sometimes have a knock-on (or knock-back) effect on a debut single. In both those cases, the two tracks then climbed the chart simultaneously. That's what happened here - as "Bring Me Some Water" made its debut, "Similar Features" jumped 10 places to land inside the top 40 for the first time. As I said three weeks ago, I wasn't a fan of Melissa's music - although I will admit this song was catchier than the first. And here's the man responsible for Johnny Diesel's success (well, partly). From live album Barnestorming, which was yet another number 1 for Barnsey, comes this cover of the 1966 Percy Sledge soul standard. Naturally, Jimmy gave it his usual scream-a-thon treatment - and the Australian record-buying public bought it in droves. I didn't like the song in the first place, so a version by one of my least favourite singers of all time was never going to help matters. I've also never really understood the appeal of buying live recordings. I can see why you might purchase a live track that isn't available elsewhere, such as Jimmy's version of "When A Man...". But, a whole live album? Why would anyone want to own inferior renditions of songs when you can just buy the studio versions? A question for the ages. 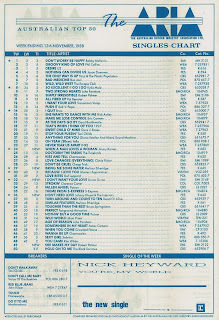 Before next week's look back at the ARIA chart from 1988, I'll conclude my countdown of my favourite top 50 songs from 1998. Although Melissa Etheridge's 'Bring Me Some Water' followed up 'Similar Features' rather swiftly on the charts, 'Similar Features' seemed to have been airing for weeks on Fox FM in Melbourne before it cracked the top 50. I remember when Barry Bissell (sp?) announced 'Similar Features' as a new entry on Take 40 Australia (which then aired a different chart to ARIA and AMR), a couple of weeks before it hit the ARIA top 40, thinking: "I've never heard of this song." Then when the song began to play, I realised, oh... it's that song I didn't previously know the name of. As for a more-successful second single causing the less-successful previous single to rise up the charts, I remember the same thing happening to Adeva, with her first 2 chart entries cracking the top 50 (and 40) during the same week. Looking back through earlier ARIA charts, the same thing happened to Eurythmics' 'Love Is a Stranger' and 'Sweet Dreams'. 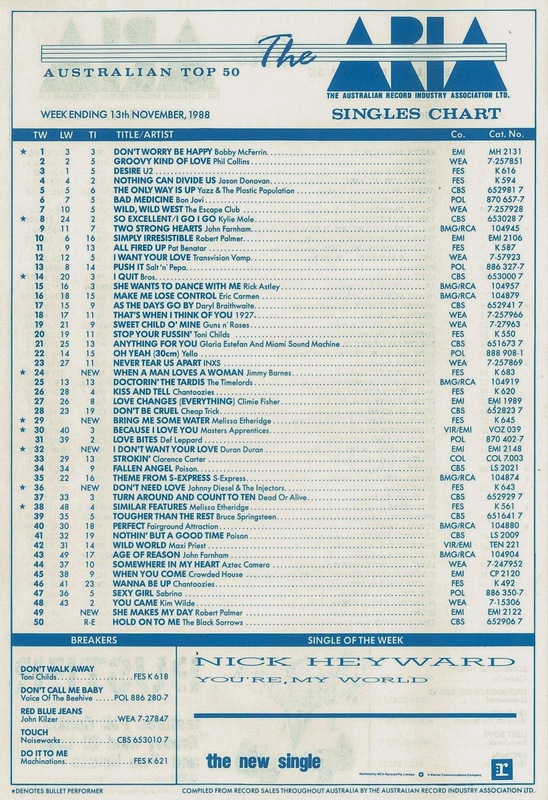 I remember finding it amusing that both 'I Want Your Love' and 'I Don't Want Your Love' were on the chart at the same time. There were a couple of times when record companies would package up two singles as a 2-for-1 deal back then. I remember buying the two Brother Beyond hits that way. I wonder how that was reflected in chart positions - which song received the "sale". Loved that Palmer track, my fave of his in fact. Was a solid album for a debut by Diesel and friends. Not very familiar with late 80's, early 90's Duran Duran but fingers crossed. Jimmy was always hit'n'miss with me but he did do some decent covers but this one was obviously a total cash grab. We'll have to agree to disagree on a few of those! There are a couple of good DD songs from that era besides I Don't Want Your Love - 1990's Violence Of Summer is probably the next best.